TO HAVE AND HAVE NOT, Howard Hawks�s more or less in-name-only adaptation of Ernest Hemingway�s "worst novel", has more in common with Casablanca (including nearly half a dozen players) than with its ostensible source material. Its real claim to fame, though, is the first pairing of Humphrey Bogart and Lauren Bacall, who appeared together in only three other films but remained ever after linked off the screen. The witty screenplay by Jules Furthman and William Faulkner samples from the novel�s dialogue, plot points, and character names, but the setting has been shifted from 1930s Cuba to WWII-era Martinique, and the drama of a broke sea captain forced to smuggle illegal immigrants to support his family has been replaced with a heroic romance about a hard-bitten ship captain asked to smuggle a French resistance leader past Vichy agents. - Steven D. Greydanus, Decent Films Guide. The aspect that elevates TO HAVE AND HAVE NOT, and the best reason to watch this movie, is the interaction between Bogart and Bacall. Not only is this the first movie they made together, but it is, in a sense, a cinematic record of their falling in love. Recently, Cameron Crowe marveled at how the blossoming on-set relationship between Tom Cruise and Penelope Cruz enriched the romantic texture of Vanilla Sky. Yet, compared to what Bogart and Bacall display in TO HAVE AND HAVE NOT, the Cruise/Cruz liaison is tepid. Bogey and his favorite leading lady made four films together (after this one, The Big Sleep, Dark Passage, and Key Largo), and the sparks between them represented the unquestionable centerpiece of each one. The chemistry is at its strongest and most unmistakable in TO HAVE AND HAVE NOT. There are times when Bacall's performance shows the rawness of her inexperience, but those moments are easily overlooked when we note how strongly matched she and Bogart are. Her screen presence reduces her limited acting experience to an irrelevance. Harry and Marie never call each other by their proper names. Instead, they are "Slim" and "Steve" - the endearments by which Hawks and his wife addressed each other in real life. 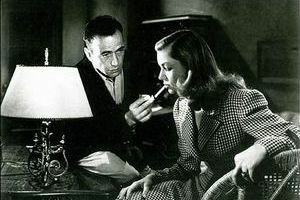 Early drafts of the script envisioned a smaller part for Bacall, but, once it became apparent that she and Bogart were burning up the screen, Hawks re-wrote page after page to bolster her part at the expense of Moran's. Hellene de Bursac, originally developed as a secondary love interest for Harry, was reduced to filling a limp supporting role that had her standing by her man and questioning why she was doing so. The dialogue, which takes full advantage of the burgeoning romance between the leads, sparkles during some of their exchanges. The most memorable lines are spoken by Bacall, employing double entendres so obvious that it's amazing they slid past the censors: "You don't have to act with me, Steve. You don't have to say anything and you don't have to do anything. Not a thing. Oh, maybe just whistle. You know how to whistle, don't you, Steve? You just put your lips together and� blow." As good as the words are, though, it takes Bacall's delivery to do them justice. The temperature in Harry's room goes up by about ten degrees. Even though Bacall and Bogart demand the camera's full attention any time they're on screen, a couple of supporting performers deserve mention. As the piano player Cricket, songwriter Hoagy Carmichael is given more than a token opportunity to tinkle the ivories and sing along (accompanied on a couple of occasions by Bacall). Veteran character actor and three-time Oscar winner Walter Brennan, playing "older" as he did so often, is Eddie, a good-hearted drunk who might easily get on the hero's (and audience's) nerves if he wasn't so harmless. Taking note of what worked best in TO HAVE AND HAVE NOT, Hawks decided to emphasize that same element in his next movie, . Fans of that delicious film noir have often noted that the plot frequently doesn't make sense, but the interaction between Bogart and Bacall is compelling enough to keep even the most inattentive viewer from losing interest. The pair married shortly after the completion of principal photography on The Big Sleep. By the time Hawks brought them back for a series of re-shoots (primarily to boost the size of Bacall's role), the wedding was in the rearview mirror. Bacall was Bogart's fourth wife, and she remained married to him until his 1957 death. As is often true of older movies, expectations have a lot to do with how TO HAVE AND HAVE NOT is received. Those anticipating something along the lines of Casablanca will be disappointed. Despite the superficial similarities and Warner Brothers' obvious desire to point them out, TO HAVE AND HAVE NOT is inferior in almost every way that matters. But for those who visit this movie to vicariously experience the beginnings of Hollywood's most famous romance, it delivers in full. Anyone who lets the film's less-than-convincing storyline fade into the background and concentrates instead on the sexually-charged dance between Harry and Marie will accept that TO HAVE AND HAVE NOT has all it needs. - James Berardinelli, Reelviews, 2004.